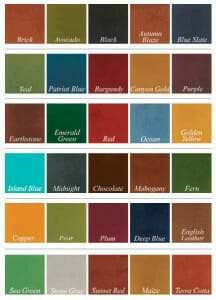 One flooring option that is slowly making its way into the garage is color dyed and acid stained garage floors. These translucent color additives can create a more vibrant and “natural look” with multiple color hues to choose from. They can also give your garage floor character as well as color. They do not peel up or crack and can be customized to whatever extent you like in terms of design, color, and gloss. They will not cover up imperfections in the concrete due to their transparent nature, but this feature can also be used to enhance the look of the floor. Though they are not the best floor covering for a working man’s garage, they do hold up quite well to lower traffic and can enhance that showroom style, custom garage look. 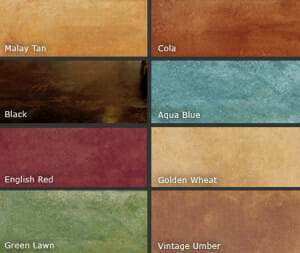 Whether you choose stain, dye, or a combination of both, it is important to know the differences between a color dyed and acid stained garage floor. Acid staining is a reactive method of coloring your slab. It penetrates the concrete and causes a chemical reaction that reacts with the lime that is present. This reaction produces a natural looking, translucent color that varies dependent on the initial color and age of the concrete. This coloring is often mottled or marbled in look and becomes a permanent part of the garage floor. Because it is translucent in color, acid stains will highlight any imperfections, cracks repairs, or color changes from old stains that are in the concrete. Many times people choose to leave the cracks alone to give the floor a weathered and broken in type of look that creates character in the flooring. The look is completely different from the more traditional garage flooring options. 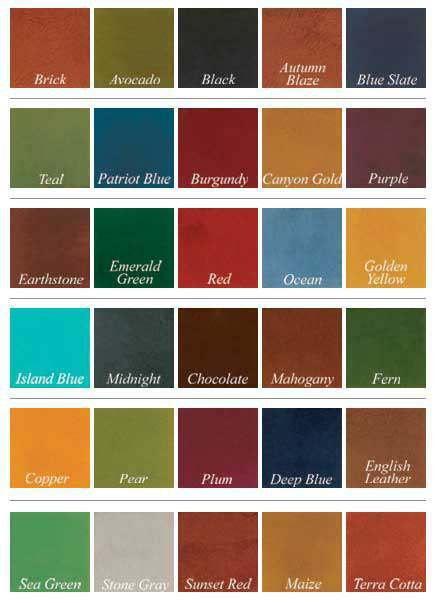 Because acids are organic in nature, color selections are limited to 8 basic, tone selections that will vary in intensity depending on the concrete they are applied to. If the surface is too smooth, the acid will not penetrate the surface and stain the concrete. You can test how well your garage floor will accept an acid stain by applying water to the surface and seeing how well it is absorbed. Any contaminants that are highlighted by the water or any place where the water beads up and isn’t absorbed is going to be a problem and will need further attention. To prepare the surface of your garage floor for an acid stain you must first clean it extremely well using a good scrubbing brush or floor buffer with a detergent and degreaser. Check again using the water test. Any concrete that is particularly dense needs to be sanded to break up the surface. Grinding is not the best method because it will remove the top coat of lime that the acid needs to react with. It will also highlight swirl marks from the grinding disk if not done carefully. Do not use muriatic acid either. The stain will not take if you use it because it will eliminate the lime that is needed to produce the color. A color dye for your garage floor is a non-reactive type of stain. The dye actually penetrates the pores of the concrete to embed the pigmented colors. Used alone or along with an acid stain, dyes can add additional colors, hues, and tones that are more vibrant. The coloring can vary depending on the concrete it is applied to and tends to deepen the color of stained concrete. Because the molecules of dyes are smaller than acid stains, they can be used in conjunction with acid stains to darken parts of the concrete that the acid stain did not take to as well. 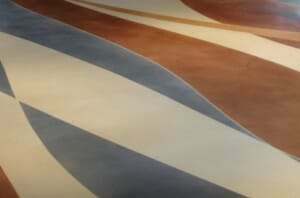 They are also used for shading and helping to create a worn or weathered look in the floor as well as 3D effects. Surface preparation is similar to acid stain. When selecting a dye for your garage floor, you usually have a choice between a solvent based or water based dye. Solvent based dyes create brighter and more bold colors while water based dyes are more soft and subtle. Solvent dyes are highly flammable however and should never be used in a garage with an open flame. Something to be aware of is that one of the downsides to color dyes is that they are susceptible to U.V. rays and can slowly fade. It is important to use a sealer that is U.V. resistant to protect the color when used in a garage environment. In order to protect your freshly stained garage floor, you need to seal it and the most common method is with a solvent or water based acrylic sealer. These sealers will typically last 18 to 24 months in a standard garage before needing to be reapplied. You can extend the protection by adding a coat or two of wax on top of the sealer like is done for indoor applications. Applying this type of sealer is easy and straight forward. Because they only offer moderate protection for scratches and some chemicals however, this type of sealer doesn’t hold up as well in a very active or working garage environment. Another option to consider for a sealer is an epoxy with a polyurethane top coat. Garage floors that have been acid stained including sanding of any areas that didn’t pass the water test should have the proper profile for epoxy. The key is to use a quality water based epoxy primer. The formulation of an epoxy primer is designed to soak into the concrete and achieve a good bond. This can then be followed up with a couple polyurethane top coats to add U.V. protection if any color dye was used and will provide superior chemical and scratch resistance. This type of coating will last years and stand up to a busy garage atmosphere. A typical acid stained and/or color dyed garage floor will cost less than you think if you want to apply it yourself. Some companies sell complete kits including required tools and a sealer for a little over $400 for a typical 2-car garage. If you have the basic tools already, then you can buy the stains and acrylic sealer separately for a little over $300. An epoxy primer and polyurethane system will add approximately another $350 – $400 to the cost of your floor. Contractors charge between $2.50 and $4.00 a square foot for a basic application and can go up in cost from there if you want something more intricate and artistic. Some contractors are even offering clear polyaspartic coatings which will protect the floor for years as well. If you’re not a fan of the more traditional look of garage floor coatings, tile, and mats, then an acid stained or color dyed garage floor would be something to consider. It can add a natural character and beauty to your garage that wasn’t possible before. This is a neat alternative to the usual epoxy floor covering. Going to have to try this soon. It looks fantastic! However, I personally prefer a low gloss finish, I think that would be easier to maintain. Wow, this is such a cool twist to the traditional concrete or epoxy floors we see in garages. I would love to have a garage floor the color of that vintage umber in the picture. It would definitely lighten up the garage and make it feel less like a dungeon! I have been looking into staining my garage floor. I personally think that it looks really great, especially when it has a glossy finish. These seem to be really nice because they make concrete look a lot nicer. This is just what I am looking for, so I will start looking at the different stains to see which one would work better. Thanks for sharing more about this, it was great to see the different stains! I have a room addition with a heated concrete floor. 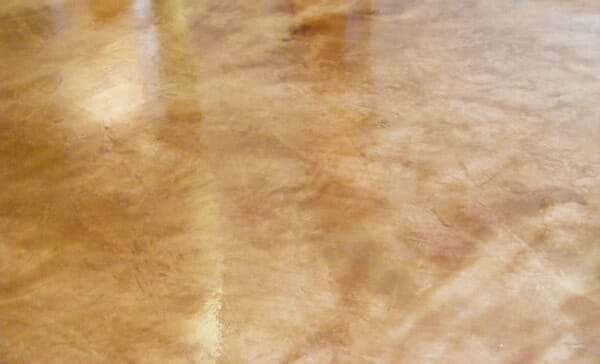 Can this type be used on this floor to give it a greater looking floor? I have been trying to find something to dress up the concrete. Hi Brenda. 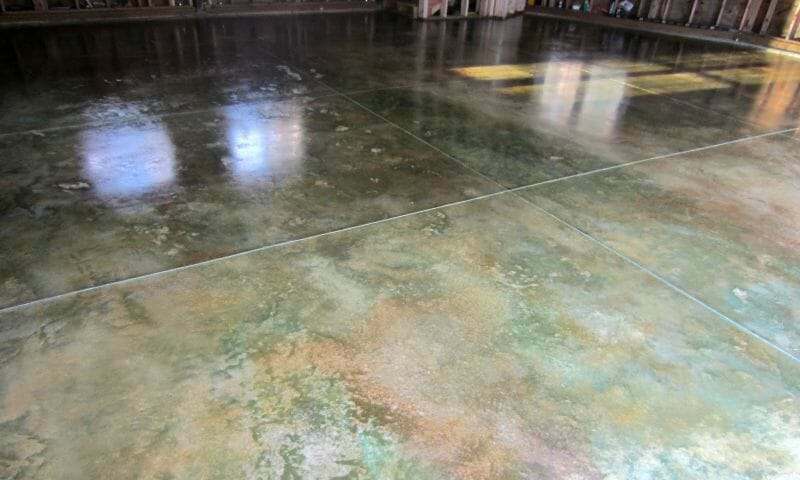 Heated concrete floors will not have any adverse affect with decorative coatings and stains. You can apply any of these without worry. Can color dyes or acid stains be used with TLPPC as a top coat if properly profiled and prepped? Would there be an advantage using this type of top coat for and sealer vs solvent or water based acrylic sealer that is normally used for top coats? Like the look and durability of the TLPPC but want a little color. Hello Ric. TLPPC should make the stain pop a little with color, but it really wasn’t designed as a top coat for decorative concrete. You may want to look at a product called Nohr-S. It’s a single component polyurea that is night and day better than an acrylic coating and tougher yet than TLPPC. It comes standard in clear and is fairly easy to apply. Check with Legacy Industrial if any concrete prep will be needed if you use an acid stain. If you use a dye, then the concrete would need to be acid etched or grinded before application of the dye and Nohr-S.
Hello Tonya. Can you explain a little bit more when you say you have cure spots that come up? Are you talking about the concrete pitting, dye spots that didn’t take, or is it something else? Did you apply a topical sealer that is coming up in places? No we don’t Tim. But if you do a Google search under images for “black concrete stain countertops” you will find many examples. In order to stain the concrete Marc, you will need to remove the epoxy by grinding. Acetone dyes and water based dyes will not be a problem. However, you may or may not be able to use an acid stain. Acid stains react with the free lime in concrete to create the staining process. Grinding can sometimes remove too much of the free lime at the surface. You will want to test it in an inconspicuous area to see if it will take if you want to pursue an acid stain. I have a 31 year old Roh tile (cement) kitchen/family room floor. It’s held up very well, but is discolored, especially in the high-wear areas. So, can I use this product and how can I make sure all areas will turn out with the same color after applying, blending in my current darker or lighter areas? Which product are you referring to Jan? There are a few different types of dyes and then of course, acid stain. They all perform differently. Hi Amy. In order to get a color close to British Racing Green, you will need to use either a solvent (acetone) or water-based dye. The color of the bare concrete also affects the color of the dye. This article from Concrete Network explains the differences well and has some references for suppliers as well. It may require intermixing colors to get the hue you want. Great article! Can you recommend a good detergent and degreaser to prepare for the acid stain? Would Seal-Krete Clean-n-Etch be a good one, or would that take out some of the lime in the concrete? Would that work for the color dyed stain as well? Hello Paul. If you are going to use an acid stain you do not want to use any product that will etch the concrete. This will remove the free lime in the concrete and greatly reduce the effectiveness of the acid stain. If you are going to use a water based stain or solvent based dye then it’s OK to etch or grind if necessary. Keep in mind that etching does not clean grease or oils from concrete. This product from Amazon is one that we know works well at cleaning concrete. 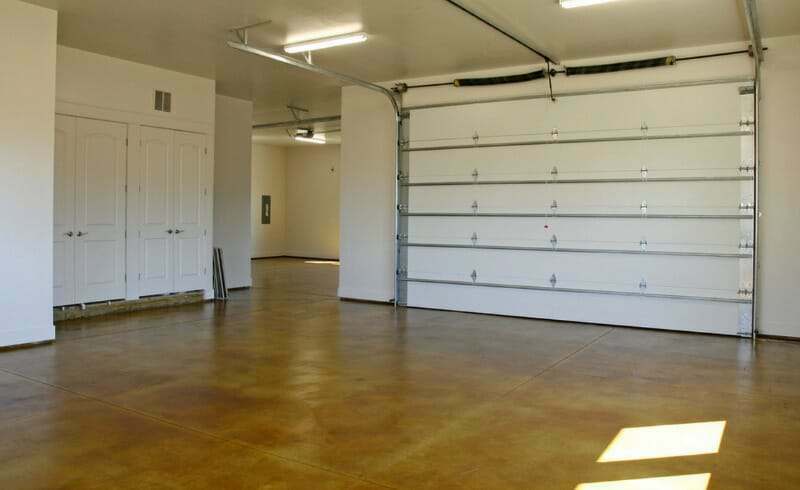 We also have this article here that gives you good tips to cleaning your garage floor as well. Hello Paul. You will need to wait 30 days for the concrete to cure before you can apply an acid stain.